Today I bring you a renewed recipe that was one of the first ones on the blog. By renewed I mean photography wise. 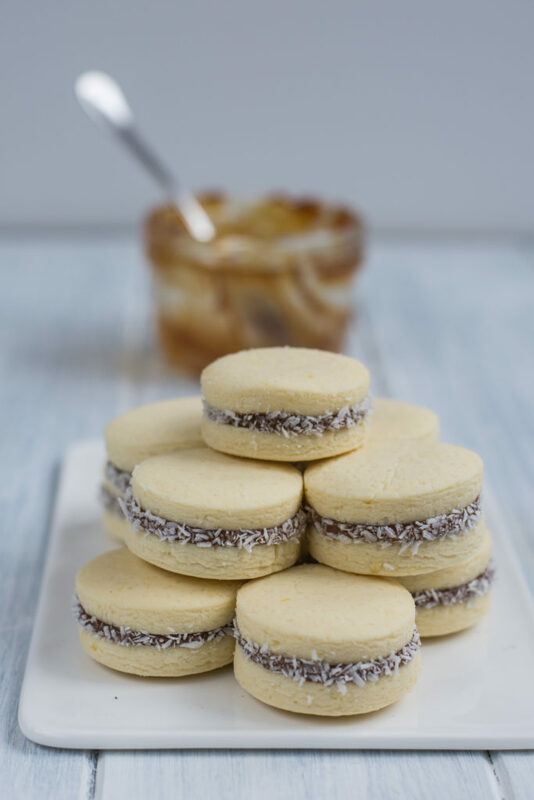 I did alfajores recently for colleagues at work and so I also did proper photos to replace the old ones. I first discovered these traditional South American cookies thanks to my friend and ex-colleague originally from the South America. 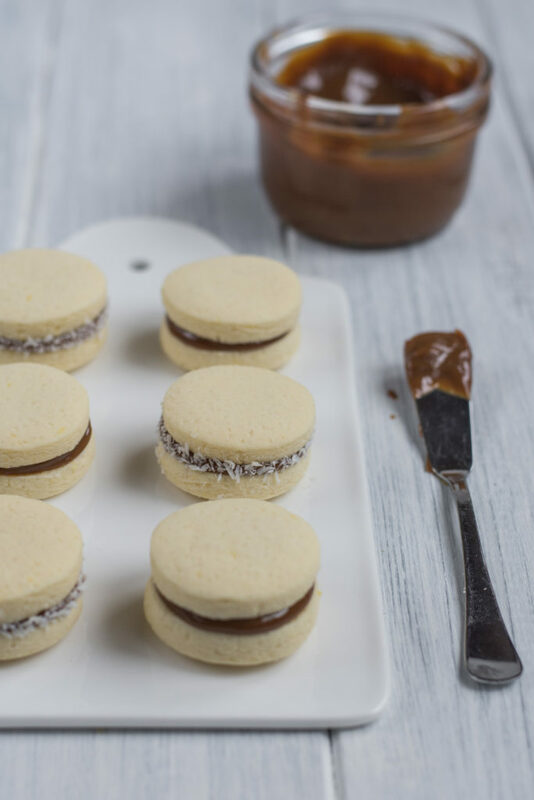 Alfajores are basically delicious tender cookies filled with dulce de leche and anytime I bring these somewhere they have a lot of success. 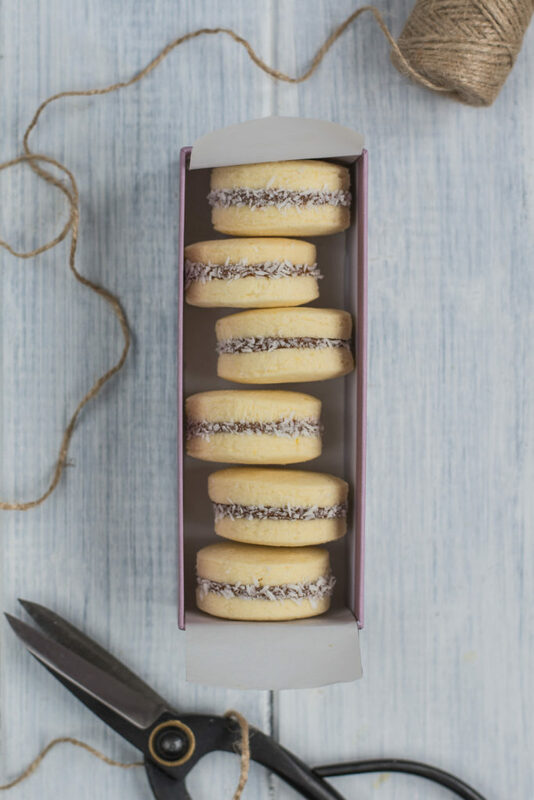 We can find alfajores in different countries of the South America such as Argentina, Chile, but also Peru and Bolivia. When we were in Peru and Bolivia, we noticed these were sold on every corner in a form of industrial cookies packed individually. 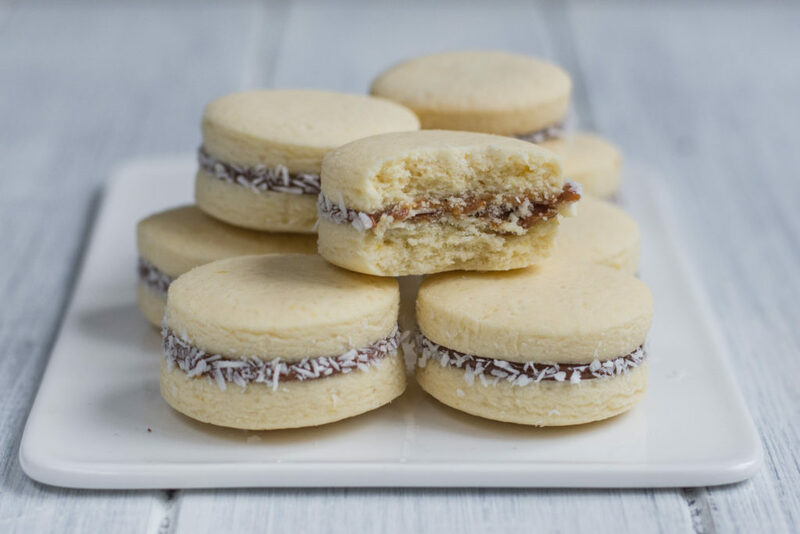 I did not like them, but I liked one fresh alfajores I got in Santa Cruz in Bolivia which tasted similarly to this recipe. Dulce de leche is basically caramelized condensed milk popular in the South American countries but also for example in the Philippines. As we have many nationalities living in Brussels, we have also some shops dedicated to other countries. And so I always buy the Argentinian one in such specialized shops, but any caramel condensed milk or the French ‘confiture de lait’ will do. 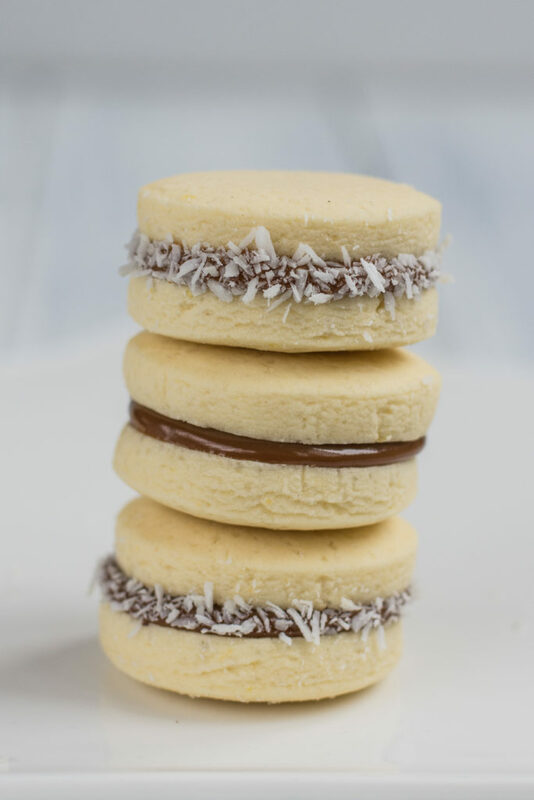 Alfajores are just divine! The fresh lemon zest gives them amazing lemon aroma and the high percentage of cornstarch makes them super tender and melt in your mouth! To finish, the sides are sprinkled with shredded coconut. If I could advise you one thing, then it would be to leave them at least overnight, they will be even better the following days! 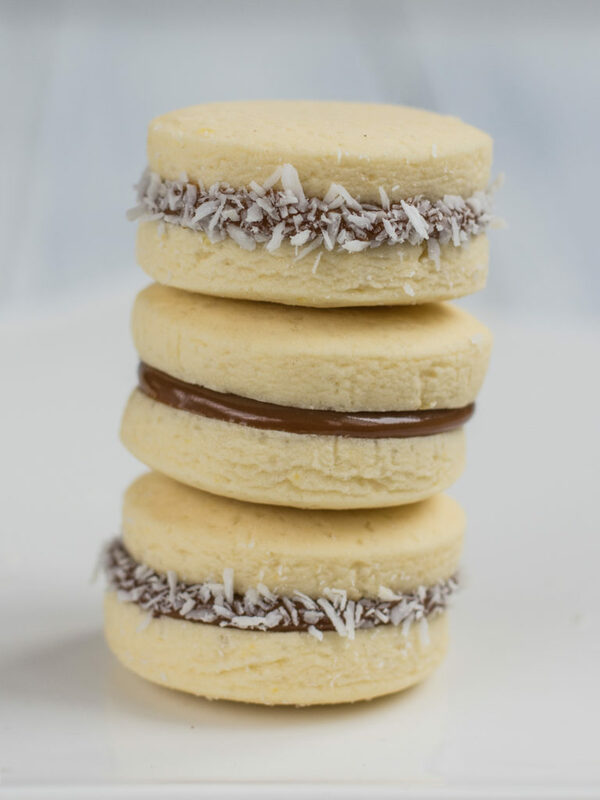 Here you have the recipe and if you try it, please do let me know how your alfajores turned out via the below comments! Also, if you like dulce de leche, try also my Muffins with Dulce de Leche with a Cheesecake Swirl. Traditional South American cookies filled with dulce de leche / caramelized condensed milk that will melt in your mouth. In a bigger bowl, mix the flour, corn starch, bicarbonate and the baking powder. In another bigger bowl, using a hand mixer, mix the butter with sugar until smooth. Add one egg yolk and when blended in, add another one and then the last one. Add vanilla and rum extract and the lemon zest. Incorporate very carefully the liquid ingredients into the dry ingredients using a spoon or a stirring spoon. Mix the dough until smooth. Work out the dough with your hands and make a ball, which you put into refrigerator for 30 min. Preheat the oven to 175°C. Take the dough out from the refrigerator and roll it out about 0,7-1 cm thick. Cut round cookies using a small glass or another cookie cutter (note that the cookies will be quite bigger after the baking). Be careful when manipulating with the dough as it is quite fragile. Place the cookies carefully on the baking sheet and bake for 7-10 minutes. Let the cookies cool down. 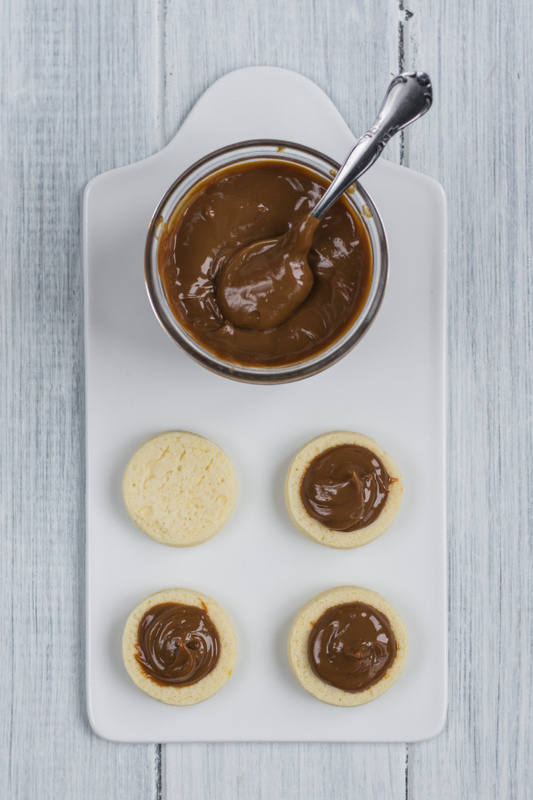 Spread the underside of a cookie generously with dulce de leche / caramelized condensed milk and sandwich together. 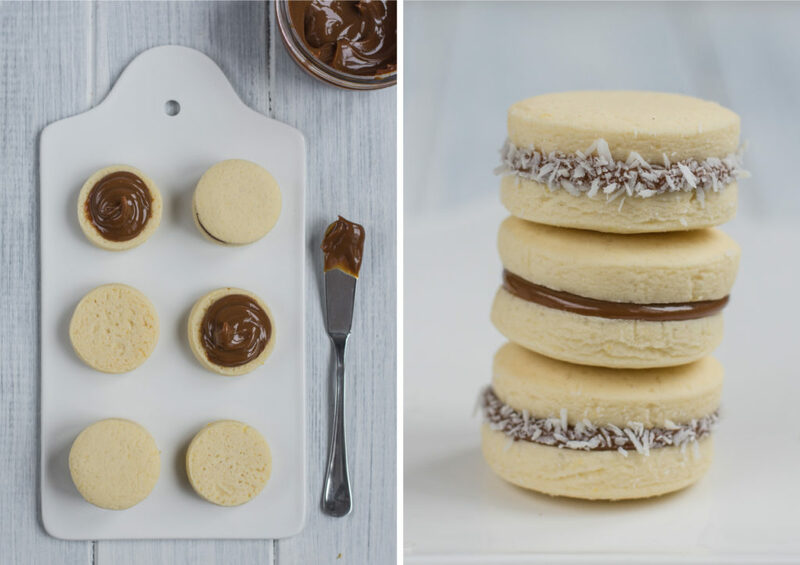 Spread also the side of each cookie with a bit of dulce de leche and roll the sides in the shredded coconut. Oh my word! Your photos are absolutely gorgeous. It makes me want to stop and take time to make these right now. I am allergic to gluten, so any suggestions for converting this into a gluten-free recipe? Would it be possible to just replace the all purpose flour with an all-purpose gluten-free flour? It sounds a little too easy. Period. But I do have hope! Thank you for sharing! Love alfajores! I’m from Santa Cruz, Bolivia. I’m glad you liked the alfajores from my country. Check out my blog. I have a few recipes from Santa Cruz ?.